The Secret Life of Your Microbiome shatters this deeply held myth, presenting a revolutionary new paradigm, backed by vast science; we're deeply connected to the biodiversity of nature through our microbiomes — the rich microbial ecosystem of our guts and skin — and this connection is essential to health and happiness. From sugar-rich diets wiping out good gut bacteria and exacerbating depression, to microbes mediating phytonutrient absorption in the brain, to inflammation and cancer, the influence of biodiversity on our bodies is everywhere. The great communicator is our immune system, a "mobile brain" that interacts with micro-organisms in and around us with profound health consequences. Written with pace, clarity, and humor by world-renowned scientists in immunology, nutrition, and environmental health, The Secret Life of Your Microbiome makes the irrefutable case that health and happiness depends fundamentally on the health of biodiversity, and shows how we can nurture this nature. Restoring health and balance through our relationship with natural environments. Scientific studies have shown that natural environments can have remarkable benefits for human health. Natural environments are more likely to promote positive emotions, and viewing and walking in nature have been associated with heightened physical and mental energy. Nature has also been found to have a positive impact on children who have been diagnosed with impulsivity, hyperactivity and attention-deficit disorder. In Your Brain on Nature, physician Eva Selhub and biophilosopher Alan C. Logan examine not only the effects of nature on the brain, but the ubiquitous influence of everyday technology on the brain, and how IT overload and its many distractions may even be changing it. Offering an antidote for the technology-addicted, the book outlines emerging nature-based therapies including ecotherapy, as well as practical strategies for improving your (and your children's) cognitive functioning, mental health and physical well-being through ecotherapeutic, nutritional and behavioural means. A powerful wake-up call for our tech-immersed society, Your Brain on Nature examines the fascinating effects that exposure to nature can have on the brain. For almost 20 years Alan has been writing books and academic articles co-authored by university-based physicians and scientists. ​Alan is highly respected for his endeavours and commitment to the scientific exploration of biopsychosocial and ecological influences in health. In particular, his focus has been on nutrition, microbiota, and natural environments, particularly as they pertain to mental health. ​​He is a Fellow of the Royal Society of Public Health. Alan has published dozens of papers in diverse scientific and medical journals, including his 2011 article in Gut Pathogens (Bowe and Logan. Acne and the Gut-Brain-Skin Axis) which has been accessed 122,000 times and is in the top 5% of all research outputs scored by Altmetric. In 2003 and 2005, Alan and his colleagues provided the first contemporary scientific frameworks for the study of beneficial microbes for cognition and depression (Logan and Katzman in Medical Hypotheses). Alan obtained his doctorate from the Canadian College of Naturopathic Medicine, graduating as Valedictorian of the Class of 2001. He is a researcher, not a clinician. From 2005-2015, Alan was an invited faculty member within the mind-body medicine courses offered at Harvard's School of Continuing Medical Education. Here, he presented on nutrition and mental health, as well as natural environments in the context of health promotion. He contributed to Harvard School of Public Health's recent Natural Environments Initiative position statement, and is a co-author within the upcoming Oxford Textbook of Nature and Public Health (Oxford University Press Anticipated 2018). Alan promotes ecological perspectives in medicine and respect for equity in health. He is co-author of Your Brain on Nature (Harper Collins, 2012). 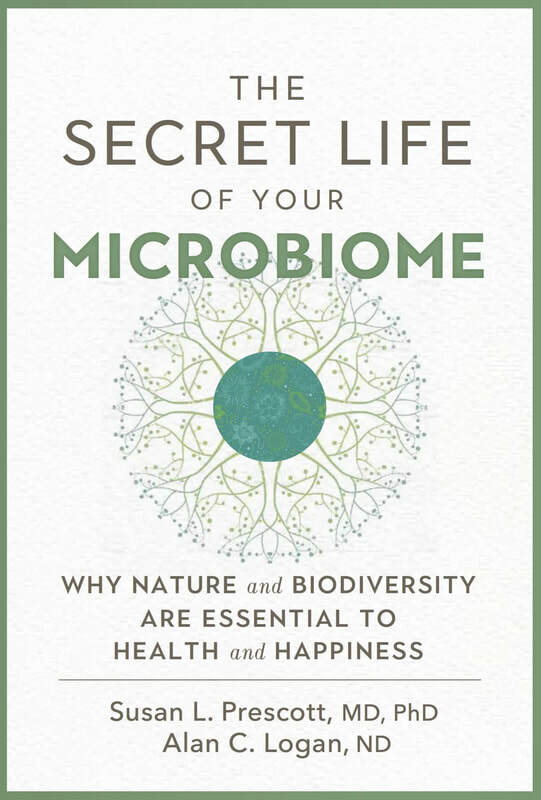 Alan’s latest book is, The Secret Life of Your Microbiome: Why Nature and Biodiversity are Essential to Health and Happiness (New Society, 2017). ​It’s all interconnected. That’s the theme of my research and my broader philosophy on life". Dr. Eva Selhub is an internationally recognized resiliency expert, physician, author, speaker, scientist and consultant. Dr. Eva engages her clients and her audiences with her powerful energy, words of wisdom and scientific knowledge to activate the five pillars of resilience–physical, mental, spiritual, relationship and team– to achieve optimal resilience, success, health and happiness. Board Certified in Internal Medicine, Dr. Eva served as an Instructor of Medicine at Harvard Medical School and as a Clinical Associate of the world renowned Benson Henry Institute for Mind-Body Medicine at the Massachusetts General Hospital for close to 20 years, serving as their Medical Director for six of those years. Dr. Selhub is now working with clients, corporations and scientific colleagues to redefine the ways in which we approach resilience to a model that incorporates alternative approaches to health as well as the concept of fitness that is achieved not only physically, but also mentally and spiritually. As a consultant, coach, author, and speaker, Dr. Selhub uses her powerful gift to translate complex information–be it scientific or esoteric writings from wisdom traditions– into practical and usable knowledge that any individual can access. She bridges science with spirit, fitness with spiritual beliefs, corporate challenges with scientific understandings of stress and homeostasis, allopathic medicine with alternative medicine, and provides the framework for individuals and organizations to achieve transformational health, wellbeing and resilience. Her newest book, Your Health Destiny, represents the culmination of her 20 years of practice in medicine with her experience in working with more esoteric healing traditions, and fusing Eastern and Western approaches to health and wellbeing. Dr. Eva is also the author of The Love Response and the co-author of Your Brain on Nature, and has a new book due to be released, Blow up or Bliss Out, in the spring of 2018. Dr. Selhub has also authored multiple relaxation CD’s, Relax into Love, Finding Stillness, Ten Minutes to Relax: The Love Response (produced by the Relaxation Company), and Meditation for Life, Love and Flow (produced and recorded with Steven Halpern). Dr. Selhub has been published in medical journals and featured in national publications including The New York Times, USA Today, Self, Shape, Fitness, and Journal of Woman’s Health, and has appeared on radio and television in connection with her work, including the Dr. Oz show. She is also a media spokesperson for Genuine Health. Dr. Selhub writes for a variety of online platforms aside from her own including The Huffington Post, MindBodyGreen, Steven Aitchison, Success Stories, Rebelle Society, Good Men Project and Human Spaces. As her clients know, Dr. Eva practices what she preaches.